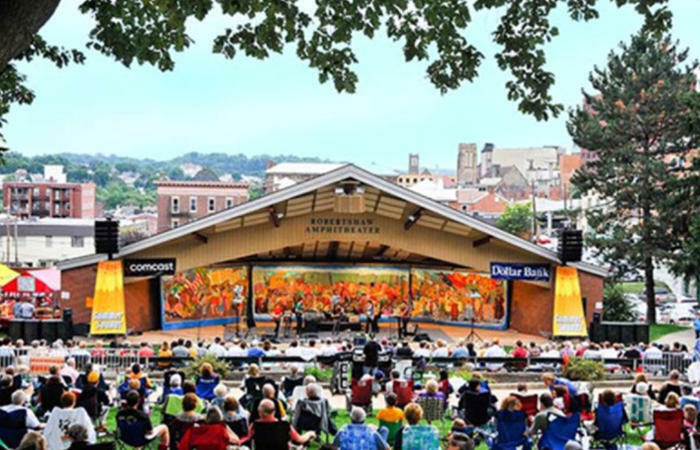 SummerSounds is a free series of exciting and interesting concerts under the stars in Greensburg's downtown St. Clair Park. Emphasizing high standards of contemporary musicianship in a family atmosphere, this series has been called "the best outdoor music series in Western PA."
This year's free concerts will delight music lovers of all ages with music ranging from jazz to rock to bluegrass, with a taste of folk, new age and country. We're proud of the variety in our programs and try to please the most sophisticated ear. Best of all, the price is free! If the music makes you feel like dancing on the lawn, all the better! Dine at one of our fine restaurants, get some munchies from our vendors or pack a dinner if you wish ... then stretch out on your blanket or lawn chair and enjoy the tunes. You're gonna love SummerSounds - we guarantee it. Shows begin at 7 p.m. Preshow music is 6:15-6:45 p.m. unless noted otherwise.